Wales arrived two players short for their first fixture against Scotland and roped in an Edinburgh University student, John Griffin, who had no Welsh connections whatsoever. Scotland won by three converted tries to one. Griffin, an English medical student at Edinburgh University, was chosen as the "least Scottish" person available and never played for Wales again. For the first time and at the sixth attempt Wales avoided defeat in an international against England. The match staged on a frozen cricket pitch adjacent to Stradey Park, Llanelli ended in a 0-0 draw, ending a run of five Test defeats. Former England skipper Martin Corry announced his retirement from international rugby. He continued to represent Leicester at domestic level, retiring from all rugby after captaining the Barbarians to victory over England in 2009. Mr Lathwell, a well-known referee, had his work cut out to prevent a robust match between the Welsh Guards and the Royal Australian Air Force breaking out into an all-out brawl at Richmond. The Aussies included several distinguished rugby league players and won 9-0 - only the second defeat of the season for the Guards. Scotland opened their Five Nations season by crashing 15-0 to a rampant French side in Paris. It was Scotland's 17th successive Test defeat since 1951 - the worst run in their rugby history. 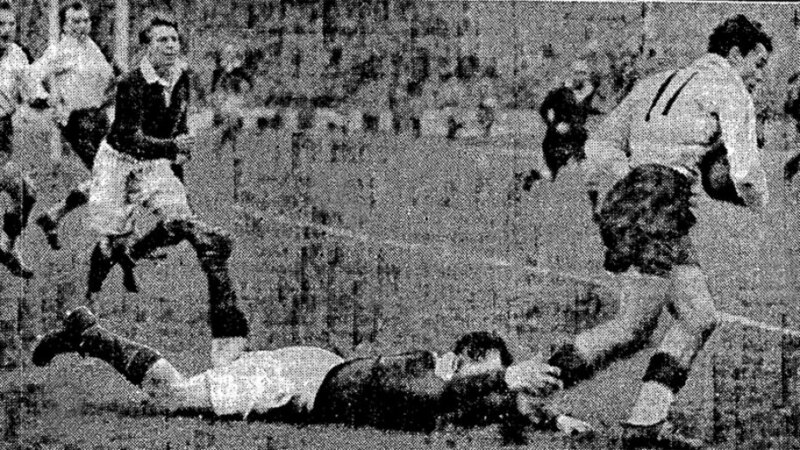 Amedee Domenech and Jean Prat were among the scorers for the French and but for pedantic refereeing the score would have been far greater. "Three years ago as the Murrayfield crowd saw Scotland crushed 44-0 by the Springboks few of them would have imagined that football of such a low standard as that provided by the home XV would be seen again on an international rugby field," wrote Pat Marshall in the Daily Express. "How wrong they were." Former England centre Bob Lloyd scored four tries for Surrey in their 34-14 win against The Army under the Hersham floodlights. Surrey captain Bob Hiller was in good kicking form, landing two penalties and converting two tries.